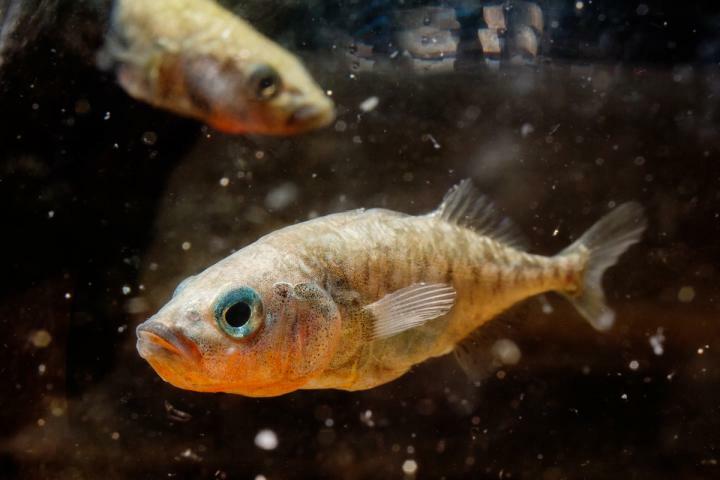 CHAMPAIGN, Ill. — A five-minute encounter with an outsider spurs a cascade of changes in gene activity in the brain that can last for hours, researchers report in a study of stickleback fish. "We are discovering that social interactions are extremely potent; they provoke big changes in gene expression in the brain," said University of Illinois animal biology professor Alison Bell, who studies behavior in three-spined stickleback fish. "These very subtle social interactions are getting under the skin and becoming embedded in the brain. Studies like ours are beginning to show how that actually works." "We used to think that DNA was so tightly packaged that it took a long time for that packaging to become unwrapped," Bell said. "But our study shows that the unpackaging can happen fast – within minutes to hours – and we show that something really subtle, like a social interaction, can provoke dramatic changes in chromatin accessibility." "We compared experimental fish – those that had the encounter – with control fish, who remained alone in their tanks," she said. "This revealed that the genes that change in tandem over time have similar functions," Bell said. Such functional groups include genes that contribute to immunity, hormone activity, metabolism or homeostasis. "We're seeing changes in gene expression even two hours after the fish interacts with an intruder. Clearly, those changes are not about the animal's initial behavior," Bell said. "We haven't studied learning and memory, but we think that these chromatin modifications and changes in gene expression are all about setting up their brains to respond to threats in the future." Previous studies suggest that the fish are learning the limits of their territory, Bell said. "Their territory basically ends where they successfully chased away an intruder," she said. "Our findings made me feel very humble; I really did not appreciate how much is going on in these guys' brains," Bell said. "If you watch sticklebacks in natural populations, they're constantly fighting with their neighbors. Our study just looked at what happened after a five-minute interaction, once. They're doing this all day long, over and over again." The paper "Temporal dynamics of neurogenomic plasticity in response to social interactions in male threespined sticklebacks" is available online and from the U. of I. News Bureau.